Pain aside, a healthy back and neck is essential to the workings of your body's electrical system - the nerve system, that helps with vital bodily functions such as breathing, eating, moods, sleeping and other minute by minute tasks that take place all the time without you even thinking about them. Yes, believe it or not your back plays a very important role in all these activities! A healthy back and neck allows you to move freely without pain or stiffness, have better energy and ultimately enjoy a better quality of life. Back and neck pain is often due to joint, disc or muscle problems and responds very well to Chiropractic joint therapy, Graston muscle therapy, Kinesio Taping and Orthotics all treatments offered at Cork Chiropractic Clinic. From your feet to your hips, your legs are constantly adapting to different terrains not to mind different shoes; from stilettos to wedges, studded sports boots to wellingtons, safety boots to flimsy sandals so it is little wonder that sometimes legs need attention! Leg pain from hips to feet is often due to joint, disc or muscle problems and responds very well to Chiropractic joint therapy, Graston muscle therapy, Kinesio Taping and Orthotics all treatments offered at Cork Chiropractic Clinic. Everyday activities such as stretching, carrying, lifting, computer, work, phone work, falls, poor posture or sports injuries all place stress on arms often causing pain, stiffness or weakness. Arm pain from shoulders to fingers is often due to joint, disc or muscle problems and responds very well to Chiropractic joint therapy, Graston muscle therapy and Kinesio Taping all treatments offered at Cork Chiropractic Clinic. At Cork Chiropractic Clinic, patients often report that wellbeing symptoms – such as low energy, indigestion, heartburn, constipation, menstrual cramps, restless legs, inability to sleep or feeling anxious – improve under chiropractic care. Chiropractors don’t treat any of the above symptoms. So you may ask how or why do these symptoms respond favourably? Well, chiropractic is based on the philosophy that in order for the body to function optimally, information must be able to travel along nerves [akin to the electric wires in your house] between the central nervous system [brain & spinal cord; akin to the fuse board in your house] and the rest of the body [akin to the sockets and lights in your house] without being interrupted otherwise as you can see from the Spinal Nerve Function Chart symptoms such as indigestion, constipation, lack of energy etc can occur. 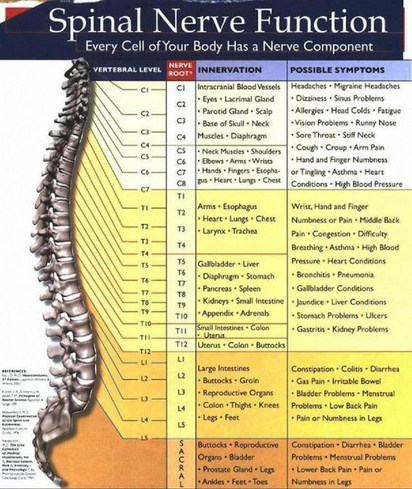 Our goal as chiropractors is to get the spine and the joints of the body working optimally, reducing any associated nerve irritation and symptoms so allowing you to feel better and enjoy a better quality of life.